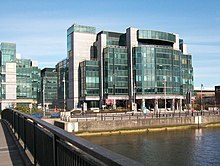 International Finance Centre, Dublin, Ireland. Ireland is a top 5 Conduit OFC, the largest global tax haven, and the 3rd largest OFC shadow banking centre. An Offshore Financial Centre or OFC is defined as a country or jurisdiction that provides financial services to nonresidents on a scale that is incommensurate with the size and the financing of its domestic economy. [a] "Offshore" does not refer to the location of the OFC (many FSF–IMF OFCs, such as Luxembourg and Hong Kong, are located "onshore"), but to the fact that the largest users of the OFC are nonresident (e.g. they are "offshore"). [b] The IMF lists OFCs as a third class of financial centre, with International Financial Centres (IFCs), and Regional Financial Centres (RFCs); there is overlap (e.g. Singapore is an RFC and an OFC). Ugland House, the Cayman Islands. The Caribbean, including the Caymans, the British Virgin Islands and Bermuda, has several major Sink OFCs, is the 2nd largest global tax haven (in aggregate), and largest OFC shadow banking centre. During April–June 2000, the FSF–IMF produced the first list of 42–46 OFCs using a qualitative approach. In April 2007, the IMF produced a revised quantitative-based list of 22 OFCs,[c] and in June 2018, another revised quantitative-based list of 8 major OFCs, who are responsible for 85% of OFC financial flows (which includes, Ireland, the Caribbean,[d] Luxembourg, Singapore, Hong Kong and the Netherlands). The removal of currency and capital controls, the early driver for the creation and use of many OFCs in the 1960s and 1970s,[e] saw taxation and/or regulatory regimes become the main reasons for using OFCs from the 1980s. Progress from 2000 onwards from IMF–OECD–FATF initiatives on common standards, regulatory compliance, and banking transparency, has significantly weakened the regulatory attraction of OFCs. Academics now consider the activities of OFCs to be synonymous with tax havens, with a particular focus on corporate tax planning BEPS tools, tax-neutral[f] asset structuring vehicles, and shadow banking/asset securitization. Spuerkeess Bank HQ, Luxembourg. Luxembourg is the 2nd largest Sink OFC, the 6th largest global tax haven, and the 2nd largest OFC shadow banking centre. Singapore Exchange, SGX Centre, Singapore. Singapore is a top 5 Conduit OFC, and is the 3rd largest global tax haven. Dutch Stock Exchange, Amsterdam, the Netherlands. 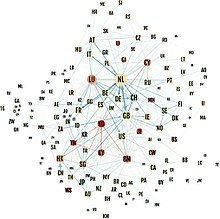 The Netherlands is the largest global Conduit OFC, and is the 5th largest global tax haven, and is the 4th largest shadow banking OFC. Disproportion between the size of the financial sector and the domestic financing needs. In April 2000, the term rose to prominence when the Financial Stability Forum ("FSF"), concerned about OFCs on global financial stability, produced a report listing 42 OFCs. The FSF used a qualitative approach to defining OFCs, noting that: Offshore financial centres (OFCs) are not easily defined, but they can be characterised as jurisdictions that attract a high level of non-resident activity [...] and volumes of non-resident business substantially exceeds the volume of domestic business. More popularly, centers which provide some of the following services: low or zero taxation; moderate or light financial regulation; banking secrecy and anonymity. An OFC is a country or jurisdiction that provides financial services to nonresidents on a scale that is incommensurate with the size and the financing of its domestic economy. The April 2007 IMF paper used a quantitative proxy text for the above definition: More specifically, it can be considered that the ratio of net financial services exports to GDP could be an indicator of the OFC status of a country or jurisdiction. This approach produced a revised list of 22 OFCs,[c] however, the list had a strong correlation with the original list of 46 OFCs from the IMF's June 2000 paper. The revised list was much shorter than the original IMF list as it only focused on OFCs where the national economic accounts produced breakdowns of net financial services exports data. Offshore financial centers (OFCs) are jurisdictions that oversee a disproportionate level of financial activity by non-residents. James R. Hines Jr. testifying to the Senate Finance Committee on Corporate Taxation in 2016. Hines is the most cited academic on research into tax havens; and his 1994 Hines–Rice paper, the most cited paper in all tax haven research, was relied upon by the Council of Economic Advisors in October 2017 when advocating the corporate tax cuts proposed by the Tax Cuts and Jobs Act. The common FSF–IMF–Academic definition of an OFC focused on the outcome of non-resident activity in a location (e.g. financial flows that are disproportionate to the indigenous economy), and not on the reason that non-residents decide to conduct financial activity in a location. However, since the early academic papers into OFCs in the late 1970s, and the FSF-IMF investigations, it has been consistently noted that tax planning is one of the prime drivers of OFC activity. The other most commonly noted prime driver is favorable regulation, or regulatory arbitrage, such as in OFCs like Liberia, that focus on shipping. "Tax havens are also known as “offshore financial centers” or “international financial centers”, phrases that may carry slightly different connotations but nevertheless are used almost interchangeably with “tax havens.”"
"Tax havens are low-tax jurisdictions that offer businesses and individuals opportunities for tax avoidance” (Hines, 2008). In this paper, I will use the expression “tax haven” and “offshore financial center” interchangeably (the list of tax havens considered by Dharmapala and Hines (2009) is identical to the list of offshore financial centers considered by the Financial Stability Forum (IMF, 2000), barring minor exceptions)"
Uncovering Offshore Financial Centers: CORPNET's network of connections between countries splitting into Conduit OFCs and Sink OFCs. While from 2010 onwards, academics began to treat tax havens and OFCs as practically synonymous, the OECD and the EU went in a different direction. By 2017, the OECD's list of tax havens only contained Trinidad & Tobago, while the EU's 2017 "blacklist" of 17 tax havens, only contained one jurisdiction, Samoa, in the top 20 tax havens, as ranked by academics and non-governmental organisations. In July 2017, the University of Amsterdam's CORPNET group ignored any definition of a tax haven and followed a quantitive approach, analyzing 98 million global corporate connections on the Orbis database. CORPNET used a variation of the technique in the IMF's 2007 OFC working paper, and ranked the jurisdictions by the scale of international corporate connections relative to the connections from the indigenous economy. In addition, CORPNET split the resulting OFCs into jurisdictions that acted like a terminus for corporate connections (a Sink), and jurisdictions that acted like nodes for corporate connections (a Conduit). Sink OFCs rely on Conduit OFCs to reroute funds from high-tax locations using the BEPS tools which are encoded, and accepted, in the Conduit OFC's extensive networks of bilateral tax treaties. Because Sink OFCs are more closely associated with traditional tax havens, they tend to have more limited treaty networks. CORPNET's lists of top five Conduit OFCs, and top five Sink OFCs, matched 9 of the top 10 havens in the Hines 2010 tax haven list, only differing in the United Kingdom, which only transformed their tax code in 2009–12, from a "worldwide" corporate tax system, to a "territorial" corporate tax system. Our findings debunk the myth of tax havens[g] as exotic far-flung islands that are difficult, if not impossible, to regulate. Many offshore financial centers[g] are highly developed countries with strong regulatory environments. All of CORPNET's Conduit OFCs, and 8 of CORPNET's top 10 Sink OFCs, appeared in the § IMF 2007 list of 22 OFCs. The following 46 OFCs are from the June 2007 IMF background paper that used a qualitative approach to identify OFCs; and which also incorporated the April 2000 FSF list which had also used a qualitative approach to identify 42 OFCs. Group III: generally seen as having a low quality of supervision, and/or being non-cooperative with onshore supervisors, and with little or no attempt being made to adhere to international standards. (‡) Dominica, Grenada, Monserrat and Palu were not on the FSF April 2000 list of 42 OFCs but were on the IMF June 2000 list of 46 OFCs. The following 22 OFCs are from an April 2007 IMF working paper that used a strictly quantitative approach to identifying OFCs (only where specific data was available[c]). (†) In on both the April 2000 FSF list of 42 OFCs, and the June 2000 IMF list of 46 OFCs. (Top 10 Sink OFC) The IMF list contains 8 of the 10 largest Sink OFCs: missing British Virgin Islands (data was not available), and Taiwan (was not a major OFC in 2007). The following 8 OFCs (or also called pass through economies) were co-identified by an IMF working paper, as being responsible for 85% of the world's investment in structured vehicles. International Finance Centre, Hong Kong. Hong Kong is the 3rd largest Sink OFC, and is the 8th largest global tax haven. (†) In the April 2000 FSF list of 42 OFCs, the June 2000 IMF list of 46 OFCs, and the April 2007 IMF list of 22 OFCs. (Top 5 Sink OFC) The IMF list contains 4 of the 5 largest Sink OFCs: missing Jersey (4th largest Sink OFC), but includes the Cayman Islands (10th largest Sink OFC). Offshore finance became the subject of increased attention since the FSF–IMF reports on OFC in 2000, and also from the April 2009 G20 meeting, during the height of the financial crisis, when heads of state resolved to "take action" against non-cooperative jurisdictions. Initiatives spearheaded by the Organisation for Economic Co-operation and Development (OECD), the Financial Action Task Force on Money Laundering (FATF) and the International Monetary Fund have had an effect on curbing some excesses in the offshore financial centre industry, although it would drive the OFC industry towards a § Focus on tax for institutional and corporate clients. The World Bank's 2019 World Development Report on the future of work supports increased government efforts to curb tax avoidance. Money laundering. In 2000 the FATF began a policy of assessing the cooperation of all countries in programmes against money laundering. Considerable tightening up of both regulation and implementation was noted by the FATF over subsequent years (see generally FATF Blacklist). Most of the principal OFCs strengthened their internal regulations relating to money laundering and criminal financial activities. Tax avoidance. Similarly, in 2000 the OECD began a policy of forcing greater compliance by traditional tax havens by increasing the requirements for data sharing and transparency to avoid being included on the OECD's tax haven blacklist. While objections from the U.S. limited the OECD's effect on tax havens, the increased information disclosure enabled tax academics to use more quantitative methods for identifying tax avoidance. Financial and banking secrecy. The April 2000 FSF OFC report, which launched the June 2000 IMF OFC initiative, led to a process of increased data disclosure and financial reporting by financial institutions in OFCs. It also led to more specific clampdowns in the area of bank secrecy, over which the IMF have greater control, and which ultimately removed much of the main distinctions between historical definitions of OFCs and tax havens. EU Commission's outline of Apple's hybrid–double Irish BEPS tax structure in Ireland, that used two branches inside a single company based on private rulings from the Irish Revenue Commissioners in 1991 and 2007. The third reason, Manage around currency and capital controls, dissipated with globalisation of financial markets and free-floating exchange rate mechanisms, and ceases to appear in research after 2000. The second reason, Favourable regulations, had also dissipated, but to a lesser degree, as a result of initiatives by the IMF–OECD–FATF post–2000, promoting common standards and regulatory compliance across OFCs and tax havens. For example, while the EU–28 contains some of the largest OFCs (e.g. Ireland and Luxembourg), these EU–OFCs cannot offer regulatory environments that differ from other EU–28 jurisdictions. By 2010, leading tax academics saw little difference between tax havens and OFCs, and treated the terms as synonymous. In August 2013, Gabriel Zucman showed OFCs housed up to 8–10% of global wealth in tax–neutral[f] structures. Others show that the main reason why private equity funds and hedge funds set up in OFCs, such as the Cayman Islands and Luxembourg, is to facilitate the personal tax planning of the managers. In August 2014, Zucman showed OFCs being used by U.S. multinationals, in particular, to execute base erosion and profit shifting ("BEPS") transactions to avoid corporate taxes. In Q1 2015, Apple executed the largest BEPS transaction in history, moving US$300 billion in intellectual property ("IP") assets to Ireland, an IMF OFC, to use the Irish "Green Jersey" BEPS tool (see "Leprechaun economics"). In August 2016, the EU Commission levied the largest tax fine in history, at US$13 billion, against Apple in Ireland for abuse of the double Irish BEPS tool from 2004 to 2014. In January 2017, the OECD estimated that BEPS tools, mostly located in OFCs, were responsible for US$100 to 240 billion in annual tax avoidance. In June 2018, Gabriel Zucman (et alia) showed that OFC corporate BEPs tools were responsible for over US$200 billion in annual corporate tax losses, and produced the a table (see below) of the largest BEPS locations in the world, which showed how synonymous the largest tax havens, the largest Conduit and Sink OFCs, and the largest § IMF 2007 list of OFCs had become. In June 2018, another joint-IMF study showed that 8 pass-through economies, namely, the Netherlands, Luxembourg, Hong Kong SAR, the British Virgin Islands, Bermuda, the Cayman Islands, Ireland, and Singapore; host more than 85 per cent of the world's investment in special purpose entities, which are often set up for tax reasons. (*) One of the largest 10 tax havens by James R. Hines Jr. in 2010 (the Hines 2010 List). (Δ) Identified on the § IMF 2007 list of 22 OFCs (note the IMF could not get sufficient data on The British Virgin Islands in 2007 for its study but did list the Cayman Islands). (⹋) Identified on the § IMF 2018 list of 8 major OFCs, or pass through economies (note the Caribbean contains the British Virgin Islands and the Cayman Islands). Banking secrecy in Switzerland is federally protected by the Banking Law of 1934. Research into OFCs highlighted shadow banking as an original service of OFCs. Shadow banking enabled the pools of offshore capital, mostly dollars, that had escaped capital controls in the 1960s and 1970s, and thus the main onshore banking systems, to be recycled back into the economic system while paying interest to the capital's owner, thus encouraging them to keep their capital offshore. They highlight the Eurodollar capital market as particularly important. However, as OFCs developed in the 1980s, it became apparent that OFC banks were not just recycling Eurodollars from foreign corporate transactions, but also capital from tax avoidance (e.g. money being hidden in tax havens), and also from other criminal and illegal sources. Many OFCs, such as Switzerland, had banking secrecy laws protecting the identity of the owners of the offshore capital in the OFC. Over the years, a § Regulatory clampdown has weakened the ability for OFCs to provide bank secrecy. Shadow banking, however, remains a key part of OFCs services, and the Financial Stability Forum list of major shadow banking locations are all recognized OFCs. Several jurisdictions included in this Report had OFI [shadow banking institution][i] sectors that were quite large compared to the size of their domestic economy: OFI assets were 2,118 times GDP in the Cayman Islands, 246 times GDP in Luxembourg, 13 times GDP in Ireland, and 8.6 times GDP in the Netherlands. No other jurisdictions exceeded 5 times GDP for this measure. OFCs, however, have expanded into a related area to shadow banking, which is asset securitisation. Unlike traditional shadow banking, where the OFC bank needs to access a pool of offshore capital to operate, securitisation involves no provision of capital. OFC securitisation involves the provision of legal structures, registered in the OFC, into which foreign capital is placed to finance foreign assets (e.g. aircraft, ships, mortgages assets etc. ), used by foreign operators and foreign investors. The OFC thus behaves more like a legal conduit rather than providing actual banking services. This has seen a rise in large specialist legal and accounting firms, who provide the legal structures for securitisations, in OFC locations. In normal securitisations, the foreign capital, assets and operators can all come from major onshore locations. For example, Deutsche Bank in Germany might lend Euro 5 billion into an Irish Section 110 SPV (the Irish securitisation legal structure), which then buys Euro 5 billion in aircraft engines from Boeing, and then leases the engines to Delta Airlines. The reason why Deutsche Bank would use an Irish Section 110 SPV is that it is tax neutral,[f] and that it has certain legal features, particularly orphaning, which are helpful to Deutsche Bank, but which are not available in Germany. Orphaning poses considerable risks of tax abuse and tax avoidance to the tax base of higher-tax jurisdictions; even Ireland discovered a major domestic tax avoidance scheme in 2016, by U.S. distressed debt funds, using the Irish Section 110 SPVs, on Irish domestic investments. OFCs sometimes market themselves as leaders in regulation operating under the highest standards with the most advanced legal systems. Because OFCs are willing to create legal structures for broad classes of assets, including intellectual property ("IP") assets, cryptocurrency assets, and carbon credit assets, there is a justification that OFCs are often at the forefront of certain types of regulation. However, in the area of more general regulation, there is little real evidence to support these claims. In addition, there are contrary examples, even from the biggest OFCs, of poor regulation and oversight. (see here). Supporters of OFCs also claim that the costs of regulation and operation in OFCs are lower than in the major financial centres due to scale effects and cheaper operating locations. However, there have been no credible studies or evidence put forward, as yet, to demonstrate that it is cheaper to operate from OFCs than major IFCs/RFCs. There is evidence that OFCs have faster approval times, even 24 hours, for approval of new legal structures and special purpose vehicles, however critics highlight this aspect as a sign of weaker regulation and oversight in OFCs (e.g. brass plate company). One of the most important service lines for OFCs is in providing legal structures for global securitisation transactions for all types of asset classes, including aircraft finance, shipping finance, equipment finance, and collateralised loan vehicles. OFCs provide what are called tax neutral special purpose vehicles ("SPVs") where no taxes, VAT, levies or duties are taken by the OFC on the SPV. In addition, aggressive legal structuring, including Orphan structures, is facilitated to support requirements for Bankruptcy remoteness, which would not be allowed in larger financial centres, as it could damage the local tax base, but are needed by banks in securitisations. As the effective tax rate in most OFCs is near zero (e.g. they are really tax havens), this is a lower risk, although, the experience of U.S. distressed debt funds abusing Irish Section 110 SPVs in 2012–2016 is notable. However, OFCs play a key role in providing the legal structure for global securitisation transactions that could not be performed from the main financial centres. The most controversial claim is that OFCs promote global economic growth by providing a preferred platform, even if due to tax avoidance or regulatory arbitrage reasons, from which global capital is more readily deployed. There are strong academic advocates, and studies, on both sides of this argument. Some of the most cited researchers into tax havens/offshore financial centres, including Hines, Dharmapala and Desai show evidence that, in certain cases, tax havens/OFCs, appear to promote economic growth in neighbouring higher-tax countries, and can solve issues that the higher-tax countries can have in their own tax or regulatory systems, which deter capital investment. Tax havens[k] change the nature of tax competition among other countries, very possibly permitting them to sustain high domestic tax rates that are effectively mitigated for mobile international investors whose transactions are routed through tax havens. [..] In fact, countries that lie close to tax havens have exhibited more rapid real income growth than have those further away, possibly in part as a result of financial flows and their market effects. CONCLUSION: Using both bilateral and multilateral samples, we find empirically that successful offshore financial centers encourage bad behaviour in source countries since they facilitate tax evasion and money laundering [...] Nevertheless, offshore financial centers created to facilitate undesirable activities can still have unintended positive consequences. [...] We tentatively conclude that OFCs are better characterized as "symbionts". However, other major tax academics take the opposite view and accuse Hines (and others) of mixing cause and effect (e.g. the capital investment would have come through the normal taxed channels had the OFC option not been available), and include papers by Slemrod, and Zucman. Critics of this theory also point to studies showing that in many cases, the capital that is invested into the high tax economy via the OFC, actually originated from the high-tax economy, and for example, that the largest source of FDI into the U.K., is from the U.K., but via OFCs. This claim can get into wider, and also contested, economic debates around the optimised rate of taxation on capital and other free-market theories, as expressed by Hines in 2011. Asset holding vehicles: Many corporate conglomerates employ a large number of holding companies, and often high-risk assets are parked in separate companies to prevent legal risk accruing to the main group (i.e. where the assets relate to asbestos, see the English case of Adams v Cape Industries). Similarly, it is quite common for fleets of ships to be separately owned by separate offshore companies to try to circumvent laws relating to group liability under certain environmental legislation. Asset protection: Wealthy individuals who live in politically unstable countries utilise offshore companies to hold family wealth to avoid potential expropriation or exchange control restrictions in the country in which they live. These structures work best when the wealth is foreign-earned, or has been expatriated over a significant period of time (aggregating annual exchange control allowances). Avoidance of forced heirship provisions: Many countries from France to Saudi Arabia (and the U.S. state of Louisiana) continue to employ forced heirship provisions in their succession law, limiting the testator's freedom to distribute assets upon death. By placing assets into an offshore company, and then having probate for the shares in the offshore determined by the laws of the offshore jurisdiction (usually in accordance with a specific will or codicil sworn for that purpose), the testator can sometimes avoid such strictures. Collective Investment Vehicles: Mutual funds, Hedge funds, unit trusts and SICAVs are formed offshore to facilitate international distribution. By being domiciled in a low tax jurisdiction investors only have to consider the tax implications of their own domicile or residency. Derivatives and securities trading: Wealthy individuals often form offshore vehicles to engage in risky investments, such as derivatives and global securities trading, which may be extremely difficult to engage in directly onshore due to cumbersome financial markets regulation. Exchange control trading vehicles: In countries where there is either exchange control or is perceived to be increased political risk with the repatriation of funds, major exporters often form trading vehicles in offshore companies so that the sales from exports can be "parked" in the offshore vehicle until needed for further investment. Trading vehicles of this nature have been criticised in a number of shareholder lawsuits which allege that by manipulating the ownership of the trading vehicle, majority shareholders can illegally avoid paying minority shareholders their fair share of trading profits. Joint venture vehicles: Offshore jurisdictions are frequently used to set up joint venture companies, either as a compromise neutral jurisdiction (see for example, TNK-BP) and/or because the jurisdiction where the joint venture has its commercial centre has insufficiently sophisticated corporate and commercial laws. Stock market listing vehicles: Successful companies who are unable to obtain a stock market listing because of the underdevelopment of the corporate law in their home country often transfer shares into an offshore vehicle, and list the offshore vehicle. Offshore vehicles are listed on the NASDAQ, Alternative Investment Market, the Hong Kong Stock Exchange and the Singapore Stock Exchange. Trade finance vehicles: Large corporate groups often form offshore companies, sometimes under an orphan structure to enable them to obtain financing (either from bond issues or by way of a syndicated loan) and to treat the financing as "off-balance-sheet" under applicable accounting procedures. In relation to bond issues, offshore special purpose vehicles are often used in relation to asset-backed securities transactions (particularly securitisations). Creditor avoidance: Highly indebted persons may seek to escape the effect of bankruptcy by transferring cash and assets into an anonymous offshore company. Market manipulation: The Enron and Parmalat scandals demonstrated how companies could form offshore vehicles to manipulate financial results. Tax evasion: Although numbers are difficult to ascertain, it is widely believed that individuals in wealthy nations unlawfully evade tax through not declaring gains made by offshore vehicles that they own. Multinationals including GlaxoSmithKline and Sony have been accused of transferring profits from the higher-tax jurisdictions in which they are made to zero-tax offshore centres. Many offshore financial centres also provide registrations for ships (notably Bahamas and Panama) or aircraft (notably Aruba, Bermuda and the Cayman Islands). Aircraft are frequently registered in offshore jurisdictions where they are leased or purchased by carriers in emerging markets but financed by banks in major onshore financial centres. The financing institution is reluctant to allow the aircraft to be registered in the carrier's home country (either because it does not have sufficient regulation governing civil aviation, or because it feels the courts in that country would not cooperate fully if it needed to enforce any security interest over the aircraft), and the carrier is reluctant to have the aircraft registered in the financier's jurisdiction (often the United States or the United Kingdom) either because of personal or political reasons, or because they fear spurious lawsuits and potential arrest of the aircraft. For example, in 2003, state carrier Pakistan International Airlines re-registered its entire fleet in the Cayman Islands as part of the financing of its purchase of eight new Boeing 777s; the U.S. bank refused to allow the aircraft to remain registered in Pakistan, and the airline refused to have the aircraft registered in the United States. A number of offshore jurisdictions promote the incorporation of captive insurance companies within the jurisdiction to allow the sponsor to manage risk. In more sophisticated offshore insurance markets, onshore insurance companies can also establish an offshore subsidiary in the jurisdiction to reinsure certain risks underwritten by the onshore parent, and thereby reduce overall reserve and capital requirements. Onshore reinsurance companies may also incorporate an offshore subsidiary to reinsure catastrophic risks. Many offshore jurisdictions specialise in the formation of collective investment schemes, or mutual funds. The market leader is the Cayman Islands, estimated to house about 75% of world's hedge funds and nearly half the industry's estimated $1.1 trillion of assets under management (although statistics in the hedge fund industry are notoriously speculative), followed by Bermuda, although a market shift has meant that a number of hedge funds are now formed in the British Virgin Islands. Traditionally, a number of offshore jurisdictions offered banking licences to institutions with relatively little scrutiny. International initiatives have largely stopped this practice, and very few offshore financial centres will now issue licences to offshore banks that do not already hold a banking licence in a major onshore jurisdiction. The most recent reliable figures for offshore banks indicates that the Cayman Islands has 285 licensed banks, the Bahamas  has 301. By contrast, the British Virgin Islands only has seven licensed offshore banks. ^ This is the IMF 2007 definition, however, it is almost identical to the general academic definition, and the other FSF–IMF–definitions of an OFC, see § Definitions. ^ a b c Ta-neutral is a term that OFCs use to describe legal structures where the OFC does not levy any taxes, duties or VAT on fund flows into, during, or exiting (e.g. no withholding taxes) the vehicle. Major examples being the Irish Qualifying investor alternative investment fund (QIAIF), and the Cayman Islands SPC. ^ a b c The FSF loosely defines other financial intermediaries as shadow banking; they are more specifically defined by the FSF as: "OFIs comprise all financial institutions that are not central banks, banks, insurance corporations, pension funds, public financial institutions, or financial auxiliaries"
^ From 2010, Hines stated in Treasure Islands that: "Tax havens are also known as “offshore financial centres” or “international financial centers”, phrases that may carry slightly different connotations but nevertheless are used almost interchangeably with “tax havens.”"
^ a b c "Financial Stability Board 2017 Report: The largest shadow banking centres". Irish Independent. 6 March 2018. ^ a b c d e f g h Damgaard, Jannick; Elkjaer, Thomas; Johannesen, Niels (June 2018). 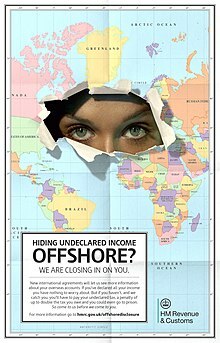 "Piercing the Veil of Tax Havens". International Monetary Fund: Finance & Development Quarterly. 55 (2). The eight major pass-through economies—the Netherlands, Luxembourg, Hong Kong SAR, the British Virgin Islands, Bermuda, the Cayman Islands, Ireland, and Singapore—host more than 85 percent of the world’s investment in special purpose entities, which are often set up for tax reasons. ^ a b Max de Haldevang (11 June 2018). "How tax havens turn economic statistics into nonsense". Quartz (publication). For example, according to the UK Treasury, on the surface it looks like Britain’s second-biggest investor is the Netherlands. But the UK Treasury has admitted most of those investments actually consist of British cash that has been sent to Holland for tax purposes and rerouted back home. So, Britain’s second biggest foreign investor is itself. ^ a b c "Report from the Working Group on Offshore Centres" (PDF). Financial Stability Forum. 5 April 2000. ^ a b c d "Offshore Financial Centers: IMF Background Paper". International Monetary Fund. 23 June 2000. ^ a b c Andrew K. Rose; Mark M. Spiegel (21 September 2007). "Offshore Financial Centers: Parasites or Symbionts?" (PDF). 117 (523). The Economic Journal: 1310–1335. ^ "TAX CUTS AND JOBS ACT OF 2017 Corporate Tax Reform and Wages: Theory and Evidence" (PDF). Council of Economic Advisors. 17 October 2017. [In the Whitehouse advocating for the TCJA] Applying Hines and Rice’s (1994) findings to a statutory corporate rate reduction of 15 percentage points (from 35 to 20 percent) suggests that reduced profit shifting would result in more than $140 billion of repatriated profit based on 2016 numbers. ^ Laurens Booijink; Francis Weyzig (July 2007). "Identifying Tax Havens and Offshore Finance Centres" (PDF). Tax Justice Network and Centre for Research on Multinational Corporations. Various attempts have been made to identify and list tax havens and offshore finance centres (OFCs). This Briefing Paper aims to compare these lists and clarify the criteria used in preparing them. ^ a b c d e f g Javier Garcia-Bernardo; Jan Fichtner; Frank W. Takes; Eelke M. Heemskerk (24 July 2017). "Uncovering Offshore Financial Centers: Conduits and Sinks in the Global Corporate Ownership Network". Scientific Reports, Nature Publishing Group. 7 (6246). ^ a b James K. Jackson (11 March 2010). "The OECD Initiative on Tax Havens" (PDF). Congressional Research Service. p. 7. As a result of the Bush Administration’s efforts, the OECD backed away from its efforts to target “harmful tax practices” and shifted the scope of its efforts to improving exchanges of tax information between member countries. ^ a b Niels Johannesen; Gabriel Zucman (12 October 2012). "THE END OF BANK SECRECY? AN EVALUATION OF THE G20 TAX HAVEN CRACKDOWN" (PDF). Paris School of Economics. ^ "European Commission - PRESS RELEASES - Press release - State aid: Ireland gave illegal tax benefits to Apple worth up to €13 billion". europa.eu. 30 August 2016. Retrieved 14 November 2016. ^ a b "The real Goldfinger: the London banker who broke the world". The Guardian. 7 September 2017. ^ Ronen Palan; Richard Murphy (2010). "Tax Havens and Offshore Financial Centres". Cornell University Press. p. 24. Yet today it is difficult to distinguish between the activities of tax havens and OFCs. ^ Paddy Carter (October 2017). "Why to Development Finance Institutions use OFCs?" (PDF). Overseas Development Institute. ^ Gabriel Zucman (August 2014). "Taxing across Borders: Tracking Personal Wealth and Corporate Profits". Journal of Economic Perspectives. 28 (4): 121–48. doi:10.1257/jep.28.4.121. ^ "BEPS Project Background Brief" (PDF). OECD. January 2017. p. 9. With a conservatively estimated annual revenue loss of USD 100 to 240 billion, the stakes are high for governments around the world. The impact of BEPS on developing countries, as a percentage of tax revenues, is estimated to be even higher than in developed countries. ^ Bershidsky, Leonid (25 July 2018). "Fighting tax dodgers can kill economic growth". Bloomberg. ^ Legitimate asset protection against future political or economic risk should be distinguished from unlawfully attempting to evade creditors; see below. ^ In practice, such attempts are rarely effective. A trustee in bankruptcy will usually have access to all of the debtor's financial records, and will usually have little difficulty tracing where the assets were transferred to. Transfers to defraud creditors are prohibited in most jurisdictions (offshore and onshore) and a bankruptcy trustee usually has little difficulty persuading a local court to nullify the transfer. Despite the poor prognosis for success, applications to courts in offshore jurisdictions seem to indicate that insolvent individuals still try this strategy from time to time, notwithstanding that it is usually a serious criminal offence in both jurisdictions. ^ Morais, Richard C. (28 August 2009). "Illicit Transfer Pricing Endangers Shareholders". Forbes. ^ "PIA pledges its fleet to fake firm". The Times of India. 12 October 2003. ^ 13 of the world's top 40 reinsurers are based in Bermuda, including American International Underwriters Group, HSBC Insurance Solutions, XL Capital Limited and ACE Limited. ^ Muspratt, Caroline (12 September 2006). "Hiscox to be domiciled in 'favourable' Bermuda". The Daily Telegraph. London. ^ "They Cayman, They Saw, They Conquered". Institutional Investor. 4 May 2006. Archived from the original on 10 March 2007. ^ Not treating Switzerland (with 500) as an offshore financial centre for these purposes.